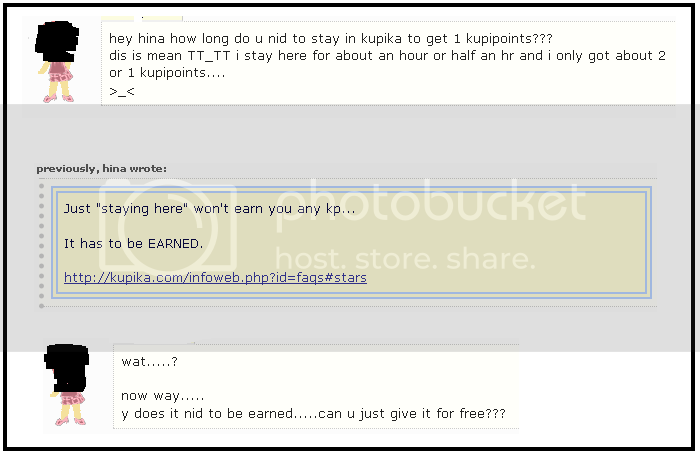 y does it nid to be earned.....can u just give it for free??? or is it a deterioration of our society / young generation? Into a poll about what? I think you it the nail on the head. I also think it is a Deterioration in society. Hell is going to freeze over. And people wonder if I'm suicidal when I say I don't want to live long.. God, why would I want to live to see the already corrupt society I live in fall apart? That isn't pretty D: The sooner I die the fking better. The way I see it, people who are like this are just people who have never had to earn anything before. They've just had everything in life handed to them on a silver platter, or their parents give them anything they want. They've never had to work for anything, or never had to save up an allowance to get something that they really wanted. Shouldn't this be in the Things That Matter area? I'm one of those people. I just realise the internet doesn't = my parents (or in my case, my nana and mother) I guess.. But I don't think that a lot of people realize that life's not always like that. You're an exception, not the rule, I guess (like me! ).